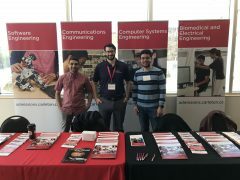 This past Saturday March 9, 2019, Carleton University held its annual March Break Day Open House, which offers prospective undergraduate students and their families a chance to learn about the university’s wide range of academic programs and student services. 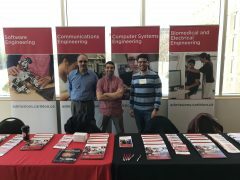 Professors Jaskolka and Gohary, along with graduate students Alex Fernandes and Mohamed Abdelazez, were at the Program and Services Fair and had the opportunity to engage with many prospective students to tell them all about the Department of Systems and Computer Engineering and the programs it offers. Professor Bailey was also on hand to give a presentation highlighting the many dynamic and innovative aspects of studying within the Department of Systems and Computer Engineering. It was a great turnout and we look forward to welcoming many new students into the Department next Fall.